I leave the atmosphere of planet Omilon 5, with a full haul of precious minerals ready for selling. I set the course in my ship to the nearest space station and activate my warp drive. 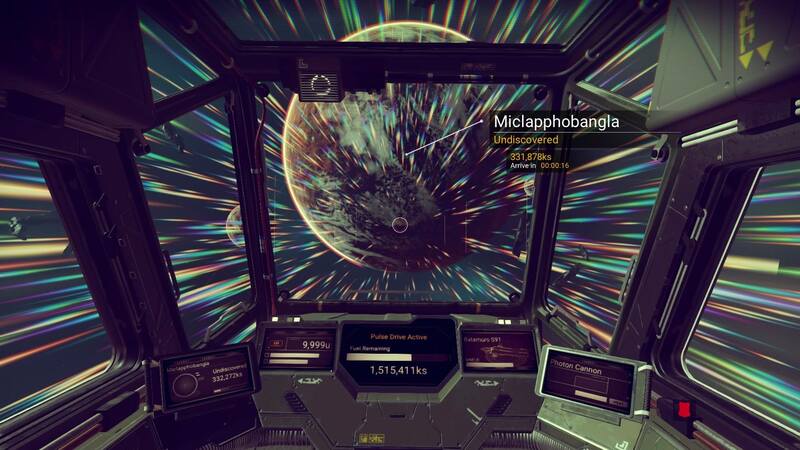 I’m mere seconds away from the station when my cockpit fills with red light and a warning message sounds: pirates. I ready myself for a fight and activate my weapons systems. This is just one of the many experiences I had in the 30 hours of playtime with No Man’s Sky. It isn’t often that we get a game that is so unique, so different from every other game out now. Most games send you through a story with a cast of characters or pit you against friends in multiplayer combat. 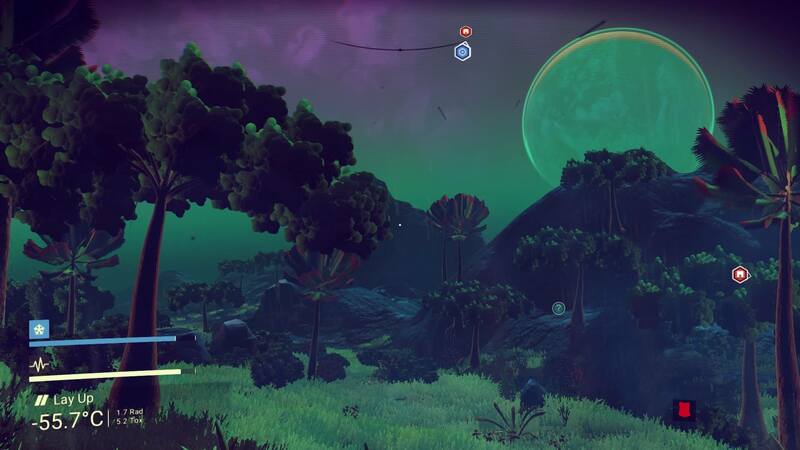 No Man’s Sky doesn’t really have a story nor does it have multiplayer, per se. This game is so different that it’s a bit difficult to review, but I’ll do my best. So, what is this game? Each new planet is a mystery, waiting to be uncovered. As annoying and vague of an answer as it is, you do whatever you want in No Man’s Sky. Explore. Gather resources. Upgrade your suit, ship, or weapon. Take copious amounts of screenshots of various planets and wildlife. Learn different languages. The game starts you off on one of the many planets in the game to introduce you to the mechanics and how the ship works. Once you’ve satisfied your curiosity of your first planet, and repaired your ship, you’re ready for space: the final frontier. As cool as the ships are, there’s no ability to customize them in any way. With 18 quintillion planets to explore, the universe is literally your oyster. And it’s a marvelous oyster, at that. I’ve conversed with friends about our journeys through space and the encounters we’ve had. One friend was constantly harassed by pirates. Another found an ancient alien monolith. I found a planet and named it “Taco Bell”. Each new planet brings a sense of wonder, or disappointment, depending on the type of planet you find. I’ve come across lush, beautiful planets covered in trees, dinosaurs roaming, and an amazing sunset coloring the landscape with red and orange hues. I’ve also come across barren, ominous moons, that had me worried something would come crawling out of the canyons near me. But with each new planet, came new things for me to explore. As you gather resources, you’ll have to manage the space well. And that’s part of the beauty of No Man’s Sky: your journey is what you make of it. Sure, there’s some loose story/objective of getting to the center of the universe. But the game never really places a sense of urgency on you like other games would. No Man’s Sky is all about the exploration, the journey of finding new alien races, languages, planets, and whatnot. I’m often reminded of Minecraft, in that, the game is really what you make of it and what you put into it. It can either be a time filled with the wonder of each new alien species you come across or it can be a monotonous grind of gathering resources. I’ve had both experiences. What is the universe like? Hello Games has accomplished something technically impressive in the breadth of its universe. Unfortunately, it doesn’t feel authentic. After several planets, I began to see a trend among them: nothing was happening on the planets. Sure, animals of various kinds were roaming (and trying to kill me). There was the occasional merchant and a combination hangar/bar with ships coming and going. But there were no interactions between the other creatures or aliens at the hangar. I didn’t come across any other players, mainly due to the size of the universe. And it’s this lack of interaction that makes No Man’s Sky feel so devoid of any meaningful life, which results in a game that’s just dreary. As peaceful as this is, there seems to be no sign of life anywhere. I remember playing Mass Effect and arriving on the Citadel for the first time. There were shops, hangars, humans, and aliens alike conversing and filling out the different sections. The planets, though mostly barren, had pockets of events that gave some semblance of existence. All those things gave me the sense that the universe I was in was authentic; living and breathing. 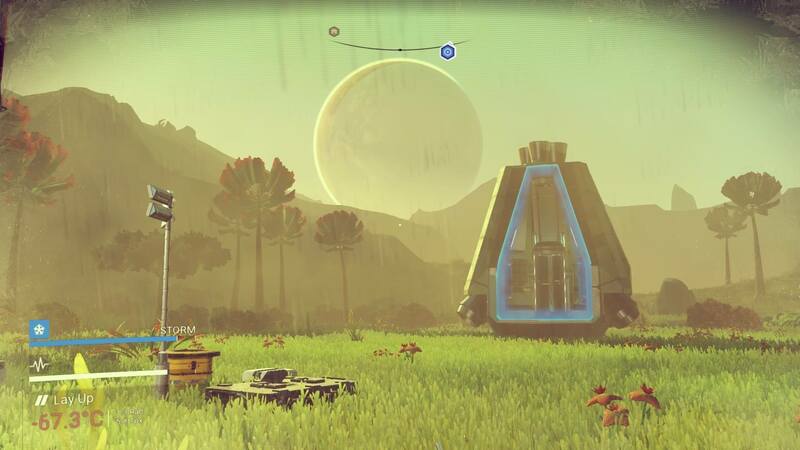 No Man’s Sky has the foundation for all of that but there’s just nothing built on it. Each new planet and space station is a brand new home with some furniture in a few rooms but no sign of anything happening. It’s a shame too because I’d love to visit a planet and meet an alien that opens up a side-story or an opportunity to aid them. Or maybe I could fight off a pirate invasion force or curb the population of a ravenous horde of monsters, anything to give me the sense that there is intelligent life and what I did mattered to a degree. 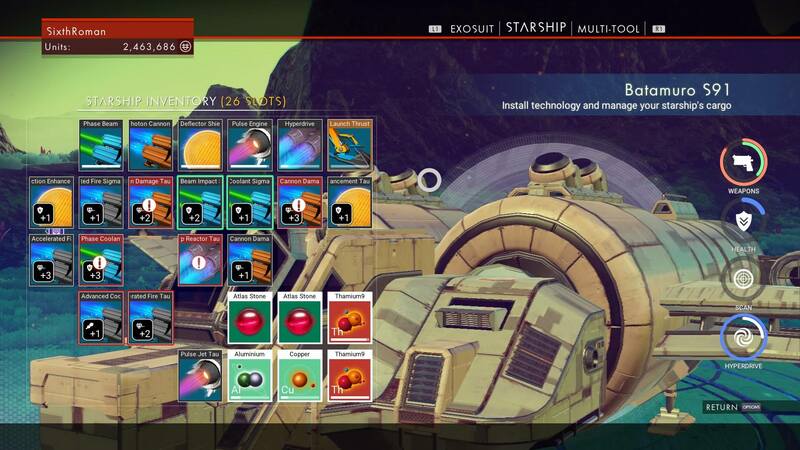 But what ultimately happens is grinding to gather resources in hopes of making money so you can purchase a new ship. It’s odd that in a universe so big, there really is not that much to do. Now, one of the nice things about 18 quintillion planets to explore is that you can only OCD so much before you come to the realization that there’s no possible way to see it all. And that’s quite liberating. Several planets I landed on I simply did not like. Rather than wasting time scouring for resources, or dealing with radiation/bad weather, I jetted out of the planet and went to another. Didn’t like that? Time to warp to another system. It’s a fantastic change of pace from games like Assassin’s Creed that just drown you with objectives in every nook and cranny of the map. You truly have complete freedom in No Man’s Sky. One of the many mysteries of No Man’s Sky. But it’s also a double-edged sword. Because of the scope of the game, and the center-of-the-universe objective in the back of your mind, it’s going to be quite some time before you ever even reach the quarter-of-the-way-there mark. Luckily, there are black holes that will speed up the journey, but they’re not in every system. This left me in a bit of a pessimistic mood. What was the point of me traveling and playing the game if it’s going to take me 60+ hours to get the center of the universe? With the fall season of games on the horizon, I was left asking myself if I even had the time for a journey to the center of the universe. You can just focus on crafting enough fuel to warp non-stop but that leads to a grind that I didn’t personally want to undertake. One thing I do want to commend No Man’s Sky for is the music of the game. It’s a splendid mix of sci-fi and ambience that drew me in. The music that plays when you enter your first space station brings about emotions of awe and accomplishment, much like how the theme in Halo fills you with a sense of purpose. 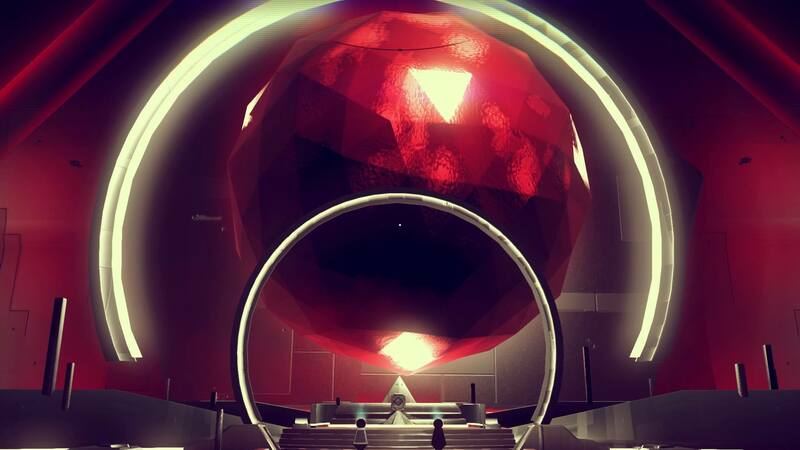 The music that plays when you encounter your first Atlas brings about curiosity and caution. Needless to say at this point, the music is firing on all cylinders and fits perfectly within the game. Really well done! No Man’s Sky is certainly a fascinating game. I would even say it’s one worth checking out. 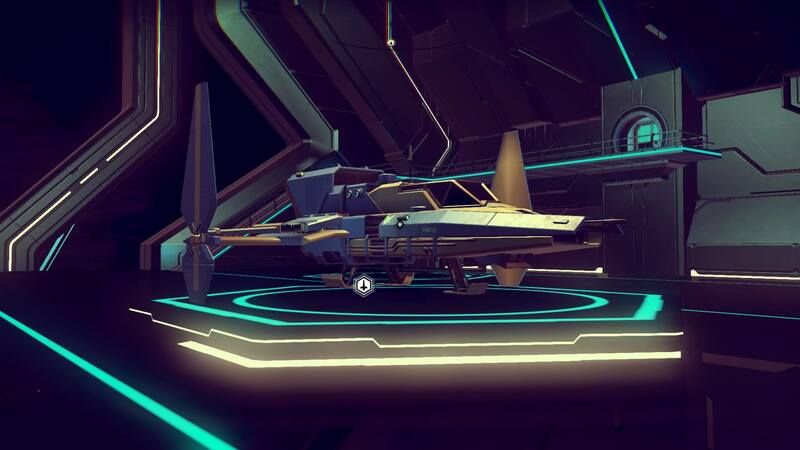 Hopefully, Hello Games will support the game well and continue to add to the universe they’ve made. Because as of right now, the universe of 18 quintillion planets is feeling a bit empty and it’s a shame because I’d love to have a reason to spend more time in the universe. I give No Man’s Sky a 7 out of 10.